Upma kozhukattai is a classic Tamil brahmin dish which is usually prepared for evening tiffin or dinner. It pairs well with kathirikai gothsu. It is usually prepared with rice rava. I have replaced rice rava with thinai rava (you will get it ready made in the market) in this recipe. 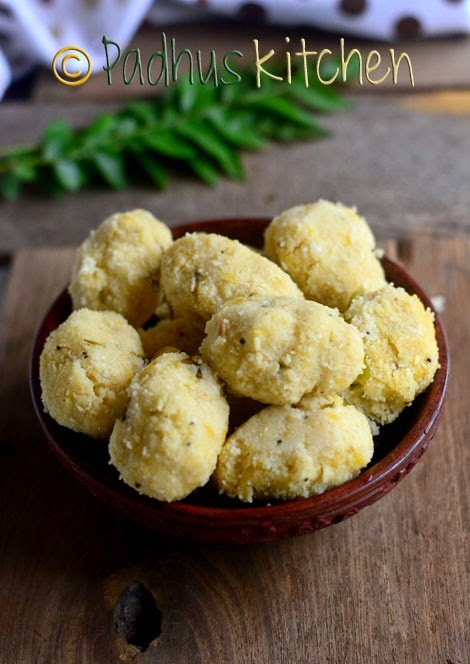 This millet upma kozhukattai is easy to prepare, tastes delicious and is perfect for dinner. We had it with pasi paruppu sambar. Today we will learn how to make millet upma kozhukattai following this easy recipe with step wise pictures. Soak tur dal for 15 minutes in hot water. Drain the water and grind it to a coarse paste and keep it aside. Heat oil, add mustard seeds, when it splutters, add urad dal, red chillies, green chillies and curry leaves. When urad dal turns golden brown, add ground tur dal and cook for 2-3 minutes stirring continuously. Add grated coconut and cook for another 2 minutes. Add 2 1/2 cup of water and salt needed. Taste the water to check for salt. If it is slightly salty, it will be perfect once you add the thinai rava. When water starts boiling, reduce the heat to low and then add add foxtail millet rava slowly with one hand and keep stirring continuously with the other hand to prevent formation of lumps. Cook covered on medium heat until all the water evaporates. Leave it to cool. When it is warm, divide the mixture into equal parts and make oval shaped dumpling. Grease your hands with a little oil to prevent the mixture from sticking to your hands. Arrange the prepared dumplings/ kozhukattai and steam cook for 15-20 minutes. You can use your idli cooker or steamer. Serve hot millet kozhukattai with chutney, gothsu or sambar or your choice. We don't get readymade millet rava here. However we get certain millets (like Thinai , Solam etc.,). Any thoughts on how to make it from scratch ? You can grind millet coarsely like rava and then sieve it. Use the rava to make upma and the millet flour - you can use it when grinding for millet dosa. I have not tried it yet,but you can do it.Yes it has to be pre cooked. I like your dishes for you make them in the same way as I have learnt to make. When people after seeing pictures of any dish that I have made, I immediately give them the link to your food blog, so that I need not write the recipe. I hate to write recipes.I loved your easy way of making Idly Kozhakatai with rice, I like simple and uncomplicated way of cooking. I have been a millets fan for many months now and make lots of dishes with millets. Very nice thought. I am basically a neutral person. I believe that we are all humans. But since people are searching like a particular sect kulambu, etc etc. I have to label that. Otherwise,I too share your feelings.